The Yorkiepoo, also called a Yorkiedoodle or a Yo-Yopoo, is not a purebred dog. It is a cross between the Yorkshire Terrier and the Poodle. The best way to determine the temperament of a mixed breed is to look up all breeds in the cross and know you can get any combination of any of the characteristics found in either breed. Not all of these designer hybrid dogs being bred are 50% purebred to 50% purebred. It is very common for breeders to breed multi-generation crosses. 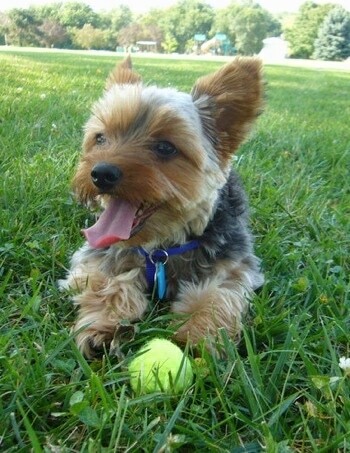 There are a few different ways breeders are producing Yorkipoos. Ask the breeder you contact which type of hybrid they breed. F1 = 50% Yorkshire Terrier and 50% Poodle - This is Yorkie to Poodle cross; this is first generation, resulting in healthier offspring. 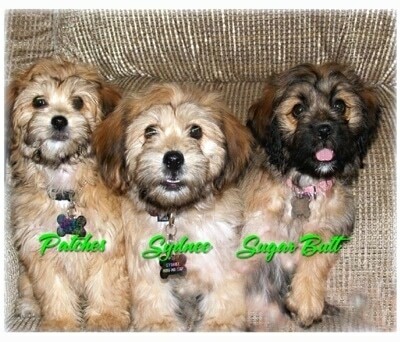 Hair type can be long like a Yorkie, or wavy like a Poodle, pups in the same litter can vary. 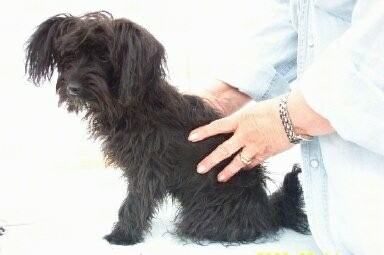 F1b = 25% Poodle and 75% Yorkshire Terrier (F1 Yorkipoo and Yorkie cross) - This is Yorkipoo bred back to Yorkie. Coat turns out more like the Yorkie. This F1b hybrid type has been given the name Yo-Yopoo. 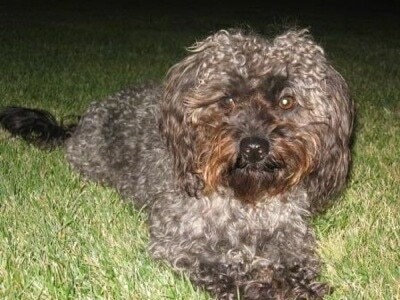 F1b = 25% Yorkshire Terrier and 75% Poodle (F1 Yorkipoo and Poodle cross) - This is Yorkipoo bred back to Poodle. 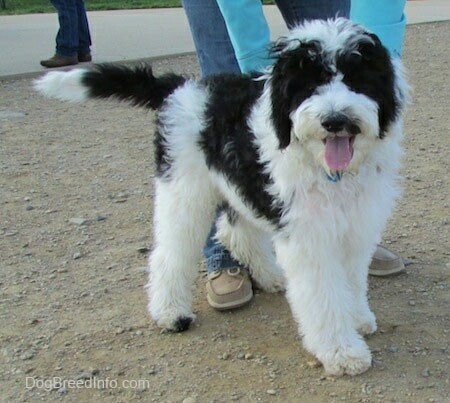 It is a wavy, curly, shaggy looking Doodle very consistent in coat types. 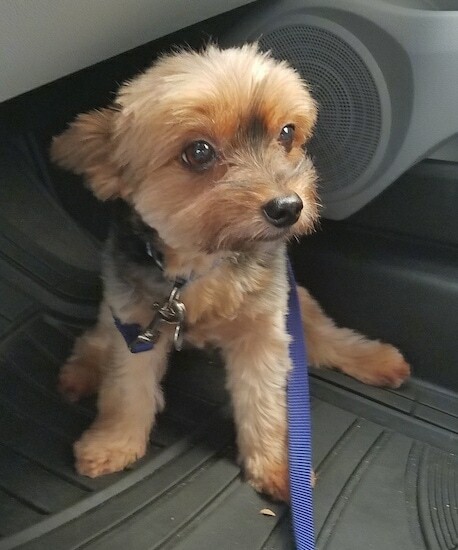 F2 = F1 Yorkipoo and F1 Yorkipoo cross - In this combination you get the same percentage of Yorkshire Terrier mix as you would in an F1 Yorkipoo. 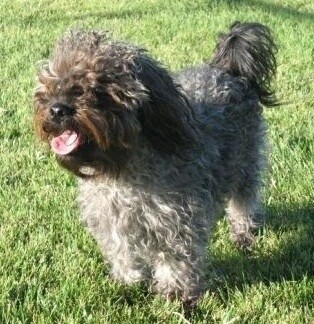 Pepper the male Yorkipoo at age 8 is an F1-class Yorkipoo (Yorkie / Poodle hybrid). He is also a retired actor. He appeared in 5 episodes of "Touched by an Angel," was runner up at the audition of "Joe Camps Benji" and has several commercials to his credit. He worked in Kevin Costner films as well. "I am not doing anything special now... just sitting on the grass." Pepper wants all his best wishes to go out to Skidboot (the famous Australian Cattle Dog). We will miss this wonderful dog. Skidboot was so cool." Pepper the male F1 class Yorkipoo (Yorkie / Poodle mix breed dog)—"He also appeared in a local cable TV restaurant commercial. The owners of the restaurant loved him!" 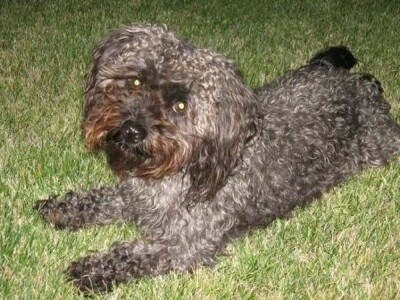 Chewie is an F1b-class Yorkipoo. He is Pepper's best friend. Chewie is an F1b-class Yorkipoo. "This is the updated picture of Malik at 7 years old. He's still 8 lbs and still loves his squeaky balls. A lot of people liked his puppy picture in the car (below). Here he is on his way to pick up his younger sister Kona, a 4 years old Staffordshire Bull Terrier. Second picture is of them in the car going back home from doggie day care." 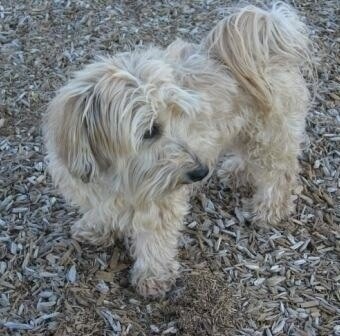 "Malik is a very smart Yorkshire Terrier / Poodle mix (F1b). In this picture he is 19 months and weighs about 8 pounds. 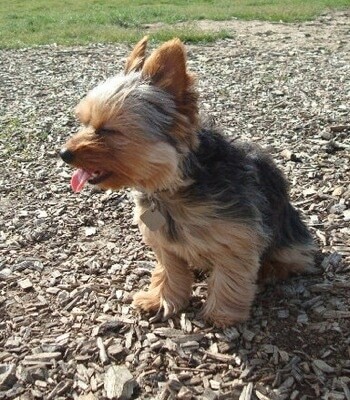 It is a windy day at the dog park." "We used to train his tricks with tiny pieces of cheese/dog treats, but we found that his favored reward, which he places a lot of value on, is the little Air Dog Squeaker by Kong. It fits right in his mouth and it looks like he's smiling when he has it in there. Here is Malik with his favorite toy." "We naturally took the role as alpha leaders for our Malik. Any human that lets his/her dog run the pack/family did not do his/her research before accepting his/her four-legged friend into the household. 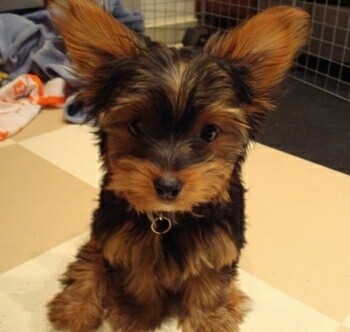 This is Malik at 4 months." "He is a well-trained dog and has been so since he was a puppy. We did not want him raised as the "typical lap dog." He fetches toys by name, can leave a treat on his nose and sprints around the apartment on command. Sometimes he gets overly excited when meeting new people and dogs so we would like to socialize him more often. Otherwise, he has a very good temperament. 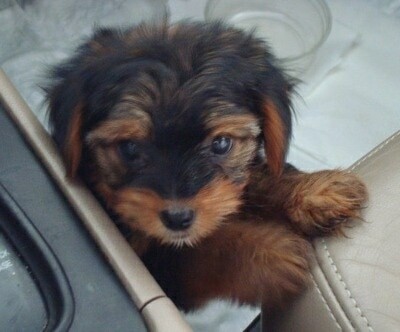 This is Malik when he was 2 months old and about 2.5 lbs."